Dubai is the host of many International fashion brands. The brands and their presence is increasing at a rapid speed along with their popularity in Dubai. Now Tom Tailor, Germany’s leading fashion brand expands their presence in Dubai. Tom Tailor, one of Germany’s leading fashion labels, has opened its third outlet in the UAE. The spacious new store is located in Ibn Battuta Mall , Dubai. Tom Tailor offers a wide range of fashionable casual apparel and vivacious urban styles for men and women. All Tom Tailor collections represent an exciting mix from three collection worlds – URBAN.FASHION.GEAR. – that can be used to create a variety of looks. With the largest collection, Authentic Urban Wear (URBAN) stands for a confident, modern style. This style is defined by looks that are casual, sporty, natural and authentic – close to the heart of the Tom Tailor brand. Contemporary Urban Style (FASHION) means high fashion with a clear, unambiguous message. The looks are self-confident, trendy, elegant, and stylish with a contemporary modern feel and less color, but made from exceptional quality, select fabrics. American College Sports (GEAR) delivers mostly casual clothes with sporty design elements. This style is defined by its sportiness as well as refined washes and details in American college style – it is fresh and colorful, relaxed and comfortable – the embodiment of the campus look. Tom Tailor currently has stores in The Dubai Mall, Dubai and World Trade Centre, Abu Dhabi. The TOM TAILOR store at Ibn Battuta Mall is the newest addition to provide modern styles for the fashion-conscious men and women in the UAE. 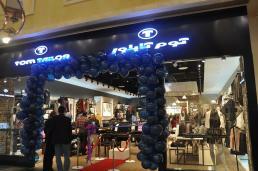 The TOM TAILOR store is conveniently located in India Court (near the cinema) at Ibn Battuta Mall . It is the latest trend that Dubai fashion world is experiencing in recent time. The expansion of Tom Tailor might prompt other fashion retailers to boost their presence as well in Dubai.